Former Obama administration National Security Adviser Susan Rice told a House committee this month she requested the identities of Trump transition aides that were hidden in sensitive intelligence reports to protect Americans' privacy rights. The three officials included candidate Donald Trump's national security adviser, retired Lt. Gen. Michael Flynn; presidential campaign chief executive Steve Bannon; and Jared Kushner, President Trump's son-in-law, according to CNN, which first reported on Rice's closed-door testimony. Details of Rice's testimony on the unmasking of Trump aides were made public Sept. 14, quoting unidentified government sources, and included comments from members of Congress who did not dispute the closed-door testimony. Rice's disclosures before the intelligence panel appear to contradict earlier statements she made asserting that she had no knowledge of the unmasking of Americans, the process of identifying the names of Americans who are protected by privacy laws and who are incidentally spied on during sensitive foreign electronic intelligence operations. In March, Rice was asked by a television interviewer about the unmasking allegations first raised by House Intelligence Committee Chairman Rep. Devin Nunes (R., Calif.). She stated: "I know nothing about this." During the House testimony, however, Rice acknowledged she had asked for the blacked-out names of the Trump advisers who had met with Sheikh Mohammed bin Zayed Al Nahyan, a UAE crown prince, in New York Dec. 15. The meeting was to discuss helping the Trump transition set up a back channel to Russia, according to CNN. Zayed's visit to New York was not known to the State Department. Asked by the Washington Free Beacon why she sought the identities of people who were part of the opposition political party and key members of an incoming administration transition team, Rice declined to comment and through a spokeswoman said the answers would "pertain to classified information." Erin Pelton, Rice's spokeswoman, said allegations that Rice improperly sought the identities of Americans from intelligence reports is "entirely false." "There is nothing improper, unusual, or political about such requests, nor do such requests bear any relationship to the unfounded and debunked allegations that the Obama White House ordered the surveillance of any U.S. persons," Pelton said. Rice also insisted that she has not and will not "divulge classified information," Pelton said. According to CNN, Rice's explanation before the committee was that she needed the names of the Americans to investigate the unannounced meeting between the UAE official and the Trump aides. That explanation, however, has raised questions among investigators over why Rice was investigating what appeared to be a law enforcement matter and not the responsibility of the White House National Security Council staff. The former White House adviser earlier had sought to deflect criticism over the allegations of improper political spying by insisting that Trump's March 4 tweet claiming the Obama administration had "wiretapped" Trump Tower was untrue. But the White House has said the president's reference to wiretapping in the tweet was meant to broadly refer to electronic surveillance. Trump told the New York Times in April that Rice's unmasking of Americans may have been illegal. "I think the Susan Rice thing is a massive story. I think it’s a massive, massive story. All over the world," Trump said, adding cryptically, "it's a bigger story than you know." Rice's testimony before the House committee is part of a committee investigation into allegations of improper intelligence gathering by the Obama administration, as well as Russian influence operations targeting the 2016 election. "We know the unmasking investigation is moving forward, and that the intel committee has amassed a lot of information about it," said one congressional official. "It seems like you had Obama officials doing this and thinking they wouldn’t get caught." 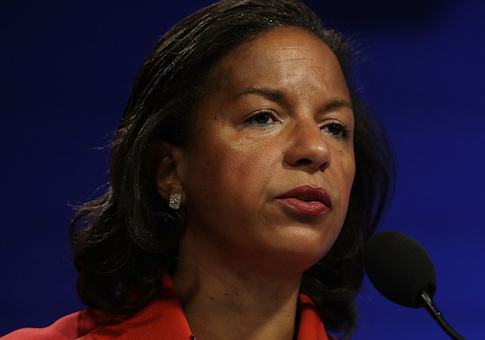 The Rice testimony included questions based on documents provided to Congress by the FBI, National Security Council, and CIA listing requests for unmasking the identities of Americans made by Rice while she was White House national security adviser. The committee requested the records in May. The panel also plans to question former U.S. Ambassador to the Untied Nations Samantha Power and former CIA Director John Brennan, who also were listed by the intelligence agency documents as having made what the committee regards as suspicious unmasking requests related to Trump campaign officials. The panel also is said to be interested in questioning Ben Rhodes, the Obama White House deputy national security adviser. House Democrats have sought to impede the committee investigation into the potential political spying that was first disclosed by Nunes in March based on a review of intelligence reports showing what the committee chairman said were questionable surveillance activities related to the Trump transition team. The reports cited by Nunes appear to be part of an electronic intelligence gathering operation between November and January—the period the Trump transition team was active. The Obama administration during that time period sought to protect intelligence information on Russian interference in the presidential election over concerns the intelligence would be destroyed by the incoming Trump administration, according to former Obama officials who spoke to the New York Times. The electronic intelligence, according to Nunes, revealed what Trump and his transition team were doing during that period and who they were meeting. Brennan, the CIA chief under Obama, was a key player in triggering an FBI investigation into Trump campaign officials based on a private intelligence dossier written by a former British intelligence officer that was funded by Democratic political operatives. The dossier has been discredited as containing false, misleading, and salacious information. CNN quoted two Republican House members as saying nothing Rice testified about in the closed hearing indicated illegal or improper spying. Others on the committee regard the Rice testimony as an admission of improper political surveillance, not an exoneration. Nunes turned over leadership of the investigation to Rep. Mike Conaway (R., Texas) after Democrats accused him of improperly disclosing sensitive information. A spokeswoman for Conaway declined to comment. The ethics probe of Nunes has been underway for several months and appears to be part of a Democratic effort to sideline the chairman since similar disclosures by Democratic committee members, including ranking member Rep. Adam Schiff (D., Calif.), did not lead to similar ethics inquiries. This entry was posted in National Security and tagged Susan Rice, Trump Administration. Bookmark the permalink.